This function is applicable to either continuous- or discrete-time models. When invoked without output arguments, initial plots the initial condition response on the screen. initial(sys,x0,Tfinal) simulates the response from t = 0 to the final time t = Tfinal. Express Tfinal in the system time units, specified in the TimeUnit property of sys. For discrete-time systems with unspecified sample time (Ts = -1), initial interprets Tfinal as the number of sampling periods to simulate. initial(sys,x0,t) uses the user-supplied time vector t for simulation. Express t in the system time units, specified in the TimeUnit property of sys. For discrete-time models, t should be of the form 0:Ts:Tf, where Ts is the sample time. 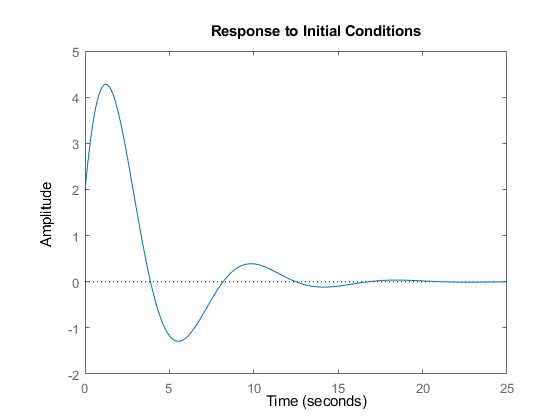 For continuous-time models, t should be of the form 0:dt:Tf, where dt becomes the sample time of a discrete approximation to the continuous system (see impulse). 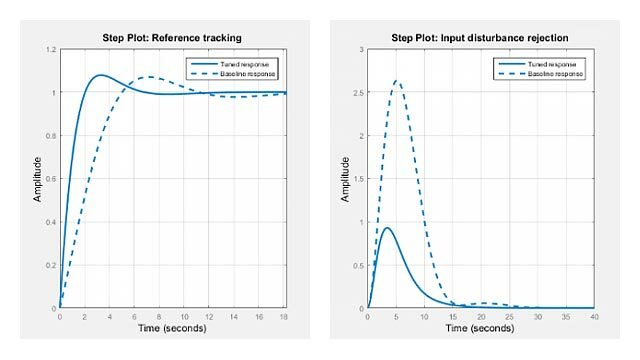 return the output response y, the time vector t used for simulation, and the state trajectories x. No plot is drawn on the screen. The array y has as many rows as time samples (length of t) and as many columns as outputs. Similarly, x has length(t) rows and as many columns as states.